Alton Towers Resort – TowersStreet - Your premier Alton Towers guide! Alton Towers is much more than just a theme park, and offers a range of different attractions and accommodation options for guests who want to extend their day out into a short break in the Staffordshire Moorlands. Whatever you’re looking for in a short break, the resort is sure to offer something to enjoy. The resort has three hotels to choose from, each with a very different theme. 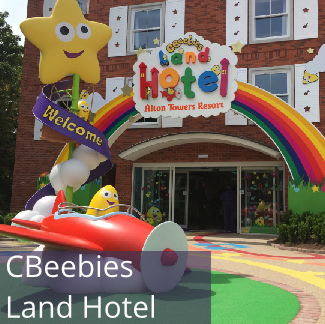 Whether it’s playtime in the CBeebies Land Hotel, Alton Towers Hotel with its Victorian grandeur or all the Caribbean fun of Splash Landings Hotel, you’re sure to have a hotel stay like none you’ve had before in these immersive environments. All the hotels have a selection of themed restaurants and bars, and offer speciality themed suites as well as standard rooms. 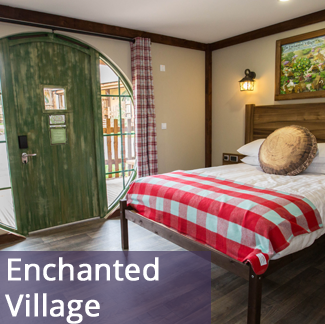 If you’re looking for an alternative to the hotels, The Enchanted Village offers a selection of lodges and treehouses set in a glade alongside the Alton Towers Hotel. At the heart of the village you can also find the Crooked Spoon, where chef conjure up a range of hearty meals to tempt your taste buds. It is well worth a visit no matter which accommodation you’re staying in, as all facilities across the are available for all. 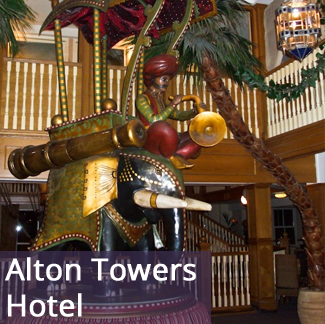 But the Alton Towers Resort is so much more than just hotels, with a range of attractions which are open to all residents and day-guests alike. 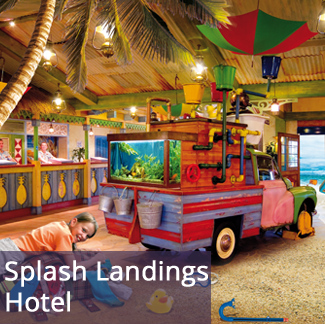 At the heart of Splash Landings is Cariba Creek, the resort’s totally tropical water park, which is a must-visit attraction for any hotel guest, as well as a good reason to visit the resort, even during the closed season to chase away the winter blues. 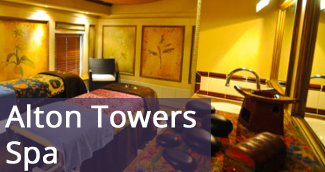 For those that prefer a more relaxing experience in a grown-up environment, the Alton Towers Spa offers a superior spa day out, with a surprisingly large array of relaxation rooms at a very reasonable price. Found in a secluded corner of the Alton Towers Hotel, the Spa also offers massages, facials and a range of other treatments, which are ideal to combat the stress and strains of a day out on park. The most recent addition to the resort line-up is the Tree Top Quest, a hire wire course located in the Enchanted Forest near the Alton Hotel which has courses for both young and old alike. Elsewhere in the resort is Extraordinary Golf, an 18 hole adventure golf course located alongside the monorail station, nearby Splash Landings. 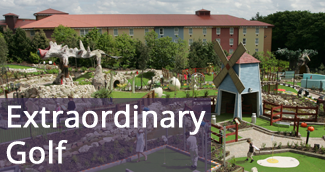 Uniquely each hole of the course is themed around attractions that have been found in the park over the years, offering a fun end to a day out at the park or attraction in its own right for hotel guests. Please Note: Tree Top Quest is due to be closed for the season. All other resort attractions are subject to additional charges, depending on the package you have booked at the hotels. 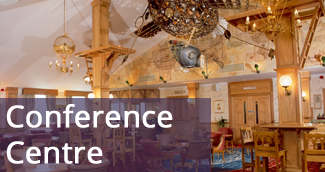 The resort is also open for businesses with Alton Towers Conference Centre available for meetings and conferences with a twist, located on the walkway connecting Alton Towers Hotel and Splash Landings. As well as this dedicated facility in the hotel complex, the park also offers a range of conferencing options within the park itself and is able to customise a package to cover almost all private hire enquiries.